Start shooting with a ZERO CREEP release today! Designed for the spot and 3D shooter who needs extreme accuracy. The new Trigger Travel Amplification TM feature eliminates creep. 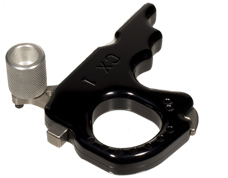 A wide range of trigger stiffness comes standard. Trigger tension can be fine tuned by simply turning the large set screw with an Allen key or change the spring by removing the set screw. After the spring has been replaced, you can then micro adjust the tension.